Time to open the twenty-seventh door in the advent calendar. Until the New Year, I'll be opening a door onto a different landscape from somewhere in the solar system. Where in the solar system is this flat-floored depression? Image resolution is about 2 meters per pixel, and the full image covers an area about 1 kilometer square. This photo is intended to check who was paying close attention to the blog in the last few weeks. You're looking at a high-resolution view of the near-Earth asteroid Eros (33 by 13 by 13 kilometers across). More specifically, this is a pond and boulder on Eros. If you have no idea what a pond on Eros might be, check out Emily Martin's guest blog post on Andrew Dombard's recent paper on ponds and boulders on Eros. This pond was photographed by Near Earth Asteroid Rendezvous (NEAR) on January 28, 2001. The image is composed of four separate NEAR MSI frames. 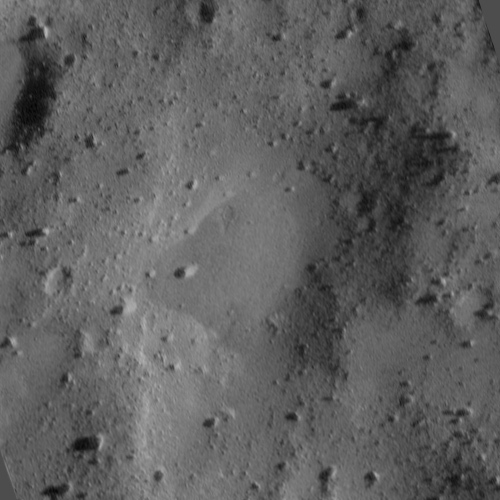 I wanted to post an image of an Eros pond that hadn't been included in Emily's writeup but I found the NEAR data set to be very difficult to browse (although it is available, as are other asteroid and comet data sets, at the Small Bodies Node of NASA's Planetary Data System). So I'm grateful to Andrew for sending me the four FITS files from which I created this composite!